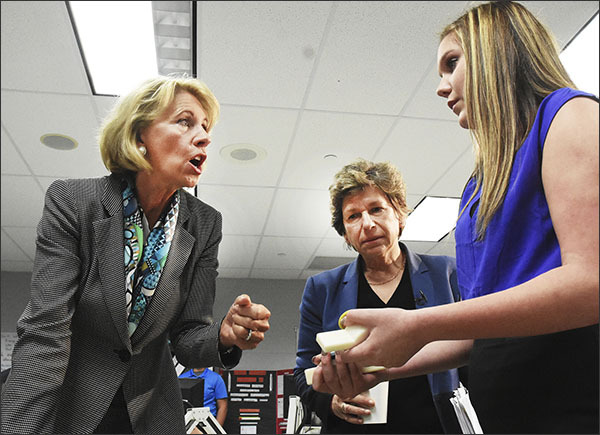 Yesterday, Secretary of Education and school choice champion, Betsy DeVos and school choice opponent and President of the American Federation of Teachers, Randi Weingarten toured a public school in Ohio. The New York Times reported that the two were there seeking some common ground in the school choice debate. While the school that DeVos and Weingarten visited is in a heavily Republican district in Ohio, the voters there are no fans of school choice. As one voter put it, vouchers are "like theft." "It's saying we passed a levy to go to our school district, and it's going somewhere else." Exactly. School choice is theft of our tax dollars and theft of our democracy. Choice sounds so democratic, so quintessentially American that voucher and charter school champions keep using the term to hoodwink people into thinking that choice in schooling is a good thing. I suggest that those of us who oppose vouchers and charter schools call school choice what it is in the eyes of that Ohio voter, tax theft. The government collects our taxes in order to provide essential services to all of us. There is no choice involved, we all must pay taxes (unless, apparently, we are hugely wealthy). Those essential services include providing for a military, promoting research on health and welfare, providing for police and fire protection, and funding public schools. When money is diverted from the support of the public schools, it amounts to, as the Ohio voter said, theft. Or maybe another way to say it is "taxation without representation", since voters have no voice and no oversight of how tax money is spent in schools that receive money through vouchers or charters. It should be readily apparent that corporate education reformers are anti-democracy. In city after city around the country democratically elected school boards have been replaced by boards appointed by the mayor or governor. In Philadelphia, an appointed board has been in place for nearly two decades and the deterioration of the schools has continued unabated. In Detroit, in Betsy DeVos' home state, the state took over the schools and has systematically led them into chaos. And let us remember that DeVos has spent millions to get legislation passed in Michigan that limits any kind of oversight for voucher and charter schools. So quite literally these schools are stealing public funds with no accountability as to how they spend it. Every truly public school is held strictly accountable for how it spends its money thorough yearly audits. Every public school is also held accountable by periodic elections for members of the school board. If stakeholders don't like the direction of their schools, they can vote in new board members who are more to their liking. Yes, it can be messy. Democracy can be messy, which is why corporate reformers try to do away with it. When parents send their children to charter schools or voucher schools, they are looking for a better opportunity for their children. We can all understand the appeal of that. What parents may not realize is that they have entered into a Faustian bargain. In order to get this shiny new toy of a voucher, they must give up their voice in their child's education. No elected school board, no independent audit, no budget vote, no say in school policies. In this drama, Betsy DeVos plays a willing Mephistopheles, offering choice, but getting you to sign away your voice. Without a voice, there is no democracy.